First of all, thank you to all the many, many hundreds of people who took 10-15 minutes to complete the survey and provide us your feedback. It has been very helpful, and we've read every single one of your responses. 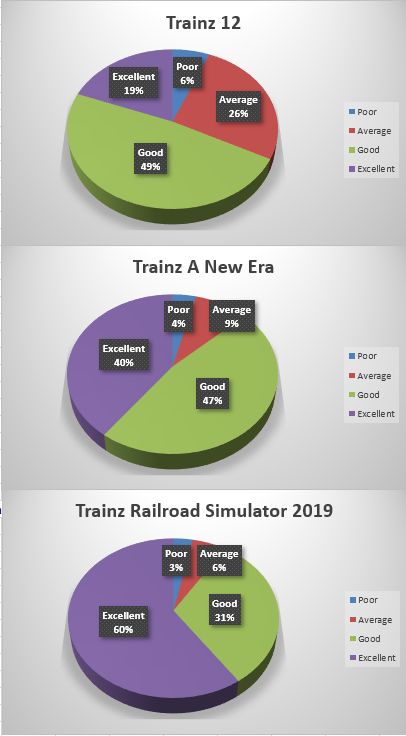 We will now continue to process the mountain of feedback and turn that into real outcomes that will make a difference to your Trainz experience. When comparing the ratings for Trainz 12, TANE and TRS19, the trend is looking very positive. Only 1 in 5 rated TS12 as Excellent, increasing to 2 in 5 for TANE. For TANE vs TS12, 20% of people moved from Average to Good and 20% from Good to Excellent. For TRS19, 3 in 5 now rate it as Excellent, and overall, 9 in 10 people rate TRS19 as either Good or Excellent. More people chose Route Building as their #1 Time Spend with 1 in 3 people choosing this option. However, 16% of people don't do any route building (and 25% don't do any session building). Overall, Free Drive is the most popular activity with 9 in 10 people doing at least some Free Driving. 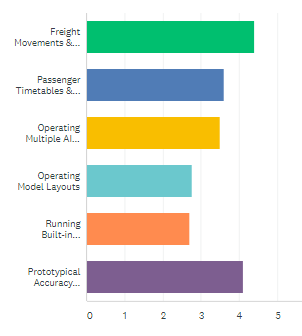 Operating AI trains is by far the most popular #3 choice, indicating a pattern of either "Drive then operate", or "Build, drive then operate". What's your most important purchasing decision factor? Performance and Stability were clear leading factors in the decision to purchase a new version of Trainz. Graphics, then New features and tools, followed. Builtin content was the least important factor overall, which isn't surprising when seeing the next set of results. Backwards compatibility was, unsurprisingly, more important among people rating Route Building #1. Which content is most important? Everyone has a favourite train, so it's not a shock to see 3rd party locos and rolling stock lead the way. However, almost 1 in 5 also voted this the Least Important option, indicating what's in the box is also important for many users. Builtin routes was the 2nd most popular #1 choice, and a similar number voted 3rd party routes as their #2 choice. Sessions are the least popular content option, suggesting that conducting your own sessions is more important. Which gameplay is most important? Freight Operations was the overall winner, just ahead of Prototypical Accuracy. However, Prototypical Accuracy was ranked as Most Important by 1 in 3 users but also ranked 5th or 6th by 1 in 4 users. Passenger Services and AI Operations were favoured equally across all 6 importance options. The route quality ratings showed that perception of quality varied widely. There's no doubt that regional differences play a big part in the ratings, and with USA being the biggest market, it was no surprise to see the USA routes do well in each section. From your comments, realism, attention to detail, and operational capabilities stood out as main reasons for choosing a "favourite". In terms of overall favourites "My route" was a very common reply! A reasonable percentage of users were unable to either find their GPU details or their VideoBenchmark Score. We suggest you review this news post from a few years ago which provides some important information about getting the most out of Trainz. For those who provided their scores, the median card among users was a GTX 780 (Passmark G3D score = 7958) or R9 390 (Passmark G3D score = 8088). To find out where your card rates in the list, visit this website. To find your hardware specification, run "Dxdiag.exe" and look at the Display tab, then enter that into the search field. There is nothing to install, and you'll find out how well your card will run the latest version of Trainz. Your comments provide a wonderful insight into the minds of our Trainz Community. Obviously there are lots of very positive comments, along with a variety of [generally] constructive criticisms of various aspects of Trainz. This comment pretty much sums up the majority of users: "I like to build my own routes, and make my own sessions and drive them automatically and just watch the traffic and scenery." One area of contention is the subscription model introduced recently. It is important to point out once again that this is purely an OPTION, and in no way affects the store purchase option that has been around for almost 20 years now. Another theme is that TANE and TRS19 are for high end machines only. It is worth noting that in like-for-like tests, TRS19 outperforms TANE which outperforms TS12. This is true for both performance and stability. On the flip-side, obviously you can't turn on the new graphics features without any performance penalty. Removing old content / Reducing "missing dependencies"
We're hard at work ensuring that we address the needs of our community. Many of you have been with us on this journey for almost 20 years now, and things are heading in the right direction. We're listening to you, and we'll keep on improving the things that matter most. TRS19 is without doubt our best version of Trainz ever (no matter what your hardware spec) and for just $10 you can actually find out for yourself by trying our Gold Class membership option for a month. Thanks again to everyone who let us know your thoughts on Trainz, and we look forward to delivering improvements to you all for many years to come!